You are currently browsing articles tagged Japan. 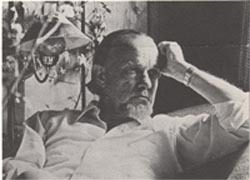 This day, January 30, marks the birth of Francis August Schaeffer, in 1912. 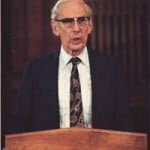 Dr. Schaeffer began his ministry with the Bible Presbyterian Church, was later a minister in the Reformed Presbyterian Church, Evangelical Synod, and when that denomination was received into the PCA, spent his final few years, from 1982 until his death in 1984, affiliated with the PCA. 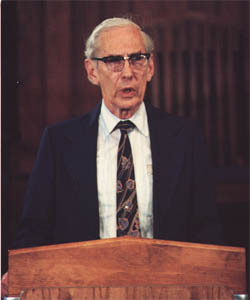 Dr. Schaeffer was the featured speaker at the 1980 “Consultation on Presbyterian Alternatives” sponsored by the Presbyterian Church in America. 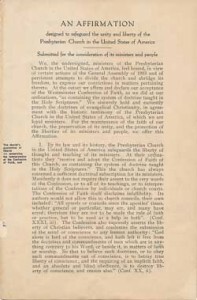 His counsel, excerpted here from the full transcript of his Pittsburgh messages, was heard by participants from several Presbyterian communions. Admittedly another long post today, but please save it to read tomorrow if you don’t have time today. Those of us who left the old Presbyterian Church USA (the “Northern” Church) 44 years ago made mistakes which marked the movement for years to come. The second principle often was not practiced. In particular we often failed to manifest an observable love for the fellow believers who stayed in that denomination when others of us left. Things were said which are very difficult to forget even more than 40 years later. The periodicals of those who left tended to spend more time attacking the real Christians who stayed in the old denomination than in dealing with the liberals. Those who came out at times refused to pray with those who had not come out. Many who left totally broke off all forms of fellowship with true brothers in Christ who did not come out. What was destroyed was Christ’s command to love each other. And what was left was often a turning inward, a self-righteousness, a hardness, and, too often, a feeling that withdrawal had made those who came out so right that anything they did could be excused. Further, having learned these bad habits, they later treated each other badly when the new groups had minor differences among themselves. We cannot stress both of the principles simultaneously in the flesh. Sometimes we stress purity without love. Or we can stress love without purity. In order to stress both simultaneously we must look moment to moment to the work of Christ and to the work of the Holy Spirit. Without this, a stress on purity becomes hard, proud, and legalistic. Without this, a stress on love becomes compromise. Spirituality begins to have real meaning in our lives as we begin to exhibit (and the emphasis here is on exhibit, not just talk) simultaneously the holiness of God and the love of God. Without our exhibition of both, our marvelous God and Lord is not set forth. Rather, a caricature is set forth and He is dishonored. We paid a terrible price for what happened in those early days. As some of you now come out of your denominations, please do learn from our mistakes. Each pastor, each congregation must be led by the Holy Spirit. If some disappoint you, do not turn bitter. One of the joys of my life occurred at the Lausanne Congress (the 1974 International Congress on World Evangelization in Lausanne, Switzerland). Some men from the newly formed Presbyterian Church in America asked me to attend a meeting they and others had called there. When I arrived I found that it was made up of Southern men who had just left the Presbyterian Church US to form the PCA and some Christians who were still in the PCUS. Someone from each side spoke. Both said to me that the meeting was possible because of my voice and especially my little book, The Church Before the Watching World (published by InterVarsity Press). I must say I could have wept, and perhaps I did. It is possible for us to do better than we would naturally do. It is not possible if we ignore the fleshly dangers and fail to look to our living Lord for his strength and grace. Those of us who left our old denomination in the Thirties had another great problem, as I see it. It was confusion over where to place the basic chasm which marks off who we are. Does that chasm mark us as those who are building Bible-believing churches and that on this side of the chasm we hold the distinctives of being Presbyterian and Reformed? Or is the primary chasm that we are Presbyterian and Reformed and that we are divided from all who are not? The answer makes a great deal of difference. When we go to a town to start a church, are we going there with the primary motivation to build a church which is loyal to Presbyterians and the Reformed faith, or are we going there to build a church which will preach the Gospel which historic, Bible-believing Christianity holds, and then on this side of that chasm teach that which we believe is true to the Bible in regard to church government and doctrine? The difference makes a difference to our mentality, to our motivation, and to the breadth of our outreach. I must say, to me one view is catholic, biblical and gives good promise of success; the other is introverted and self-limiting, yes, and sectarian. I spoke of a good promise of success. I mean on two levels: First in church growth and a healthy outlook among those we reach; second, in providing leadership in the whole church of Christ. We alone do not face this problem of putting the chasm at the wrong place, of course. A too zealous mentality on the Lutheran view of the sacraments is the same. A too sectarian mentality in regard to the mode of baptism is another. The zeal of the Plymouth Brethren for an unpaid ministry is often the same. No, it is not just our problem. But it is our problem. To put the chasm in the wrong place is to fail to fulfill our calling, and I am convinced that when we do so we displease our Lord. Those who remain in the old-line churches have their own set of problems. In contrast to the problem of hardness to which those who withdraw are prone, those who remain are likely to develop a general latitudinarianism. One who accepts ecclesiastical latitudinarianism easily steps into a cooperative latitudinarianism which can become a doctrinal latitudinarianism and especially a letdown on a clear view of Scripture. This is what happened in certain segments of what I would call the evangelical establishment. Out of the evangelical latitudinarianism of the Thirties and Forties grew the letdown in regard to the Scripture in certain areas of the evangelical structure in the Seventies. Large sections of evangelicalism today put all they can into acting as though it makes no real difference as to whether we hold the historic view of Scripture or the existential view. The existential methodology says that the Bible is authoritative when it teaches “religious” things but not when it touches that which is historic, scientific, or such things as the male/female relationship. Not all who have stayed in the liberal denominations have done this, by any means, but it is hard to escape. I don’t see how those who have chosen to stay in (no matter what occurs) can escape a latitudinarian mentality which will struggle to paper over the differences on Scripture in order to keep an external veneer of unity. That veneer in fact obscures a real lack of unity on the crucial point of Scripture. And when the doctrinal latitudinarianism sets in we can be sure from all of church history and from observation in our own period of church history that in just a generation or two the line between evangelical and liberal will be lost. This is already observable in that the liberals largely have shifted to the existential methodology and have expressed great approval that the “moderate evangelicals” have done so. The trend will surely continue. Unless we see the new liberalism with its existential methodology as a whole, and reject it as a whole, we will, to the extent to which we tolerate it, be confused in our thinking. Failure to reject it will also involve us in the general relativism of our day and compromising in our actions. The second major problem of those who stay in the liberally controlled denominations is the natural tendency to constantly move back the line at which the final stand will be taken. For example, can you imagine Clarence Macartney, Donald Grey Barnhouse or T. Roland Phillips being in a denomination in which the battle line was the ordination of women? 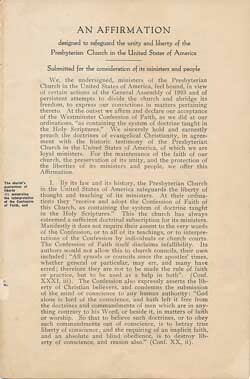 Can you imagine these great evangelical preachers of the Twenties and Thirties (who stayed in the Presbyterian Church USA) now being in a denomination which refuses to ordain a young man whose only fault was that while he said he would not preach against the ordination of women yet he would not say he had changed his mind that it was unbiblical? Can you imagine that these leaders of the conservative cause in an earlier era would have considered it a victory to have stalled the ordination of practicing homosexuals and practicing lesbians? What do you think Macartney, Barnhouse, and Phillips would have said about these recent developments? Such a situation in their denomination would never have been in their minds as in the realm of conceivable. The line does move back. In what presbytery of the Northern Presbyterian Church can you bring an ordained man under biblical discipline for holding false views of doctrine and expect him to be disciplined? Beware of false victories. Even if a conservative man is elected moderator of the general assembly (as Macartney was in 1924), it would amount to absolutely nothing. Despite the jubilation among conservatives at Macartney’s election, the bureaucracy simply rolled on, and not too many years later conservative leader J. Gresham Machen could be unfrocked. 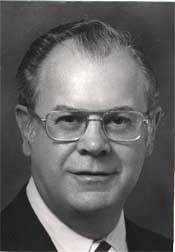 Nelson Bell was elected moderator of the Southern Church later (in 1972), and nothing changed. The power centers of the bureaucracy and the liberally-controlled seminaries were unmoved. There are always those who say, “don’t break up our ranks … wait a while longer … wait for this … wait for that.” It is always wait. Never act. But 40 years is a long time to wait when things are always and consistently getting worse. And (with my present health problem) I tell you soberly, we do not have forever to take that courageous and costly stand for Christ that we sometimes talk about. We do not have forever for that. We hear many coaxing words, but watch for the power structure to strike out when it is threatened. If the liberals’ power is really in danger or if they fear the loss of property, watch out! What of the future? We live in a day that is fast-moving. The United States is moving at great speed toward totally humanistic orientation in society and state. Do you think this will leave our own little projects, our own church, and our own lives untouched? Don’t be silly. The warnings are on every side. When a San Francisco Orthodox Presbyterian congregation can be dragged into court for breaking the law of discrimination because it dismissed an avowed, practicing homosexual as an organist, can we be so blind as to not hear all the warning bells go off? When by a ruling of a federal court the will of Congress can be overturned concerning the limitation on the willful killing of unborn children, should not the warning bells go off as to the kind of pressures ahead of us? Who supports these things? The liberal denominations do, publicly, formally, and financially. And it puts into a vise those of us who stand for biblical morality, let alone doctrine. Beyond the denominations, it is their councils of churches that support not only these things but also terrorist groups. They give moral support and money. Should we support this by our denominational affiliation? We may seem isolated from the results for a time but that is only because we are too blind to see. I don’t think we have a lot of time. The hour is very late, but I don’t think it is too late in this country. This is not a day of retreat and despair. In America it is still possible to turn things around. But we don’t have forever. Bruce Hunt was not totally unprepared for the inevitable. This Orthodox Presbyterian missionary had been ministering to the Korean Church in Manchuria since 1936. With the imperial nation of Japan on the offensive, attempts had been made to control the church in lands under their control. Specifically, the attempt was being made to force all people, including Christians, to engage in emperor worship. To committed Christians, to those who confessed that Jesus is Lord alone with no other God beside Him, this was unthinkable. Bruce Hunt not only believed this firmly, but he taught this truth to the church of Korea. Twice he had been taken down to prison and warned that if he persisted in his teaching, judgment would be waiting. 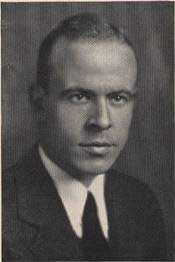 On October 21, 1941, Bruce Hunt was arrested in Harbin, Manchuria. For the next year, Rev. Hunt would be separated from his family, his church family, and his freedom. But he was not separated from his God and Savior. In testimony of the gospel, like countless persecuted Christians before him, including the apostle Paul of New Testament times, he witnessed to his tormenting guards, evangelized his fellow inmates, and offered encouragement to others who were being tried for their Christian faith. In one of the many cells into which he was thrown, he realized that a tiny metal tip on one of his shoe laces provided him with a writing tool. In the darkness of his cell, he wrote in Korean on the soft walls of the cell the famous verse, “For God so loved the world, that He gave His own begotten Son, that whosoever believeth in Him, should not perish, but have everlasting life.” You dear reader, surely recognize these words as coming from John 3:16. It was just one of the many times that he left a witness to the next prisoner who would enter that cell. Once, he decided to place all ten commandments of the Law of God upon the wall in Korean. He made it to eight commandments, when a guard saw it and stopped him from completing it. Finally, when all “tools” to write had been taken away, Scripture texts on his lips provided divine opportunities to share his Christian faith with guards and fellow prisoners alike. Quite clearly, while Rev. Hunt was imprisoned, the Word of God was not imprisoned. Eventually he was exchanged and went back to the United States with his family. Words to live by: In our true story about Bruce Hunt writing Scripture texts on the wall of his cell, there is a very real presupposition which was necessary for him to witness in this way. And it was this. He had memorized certain portions of the Word of God so that he could write them without having his Bible as a guide. Question? If you did not have your Bible present with you to read and write verses of it, how many texts of Scripture have you memorized which could prove to be a comfort to you and a witness to others in prison with you? Scripture memorization, even with a proliferation of Bible versions today, is a spiritual exercise of our parent’s generation. Yet, we are closer than they are to difficult times. Memorize the Word of God! Begin today. Start with the texts of salvation. Ask your pastor what you should memorize. Ask yourself the question, what verses would I want to know if I was arrested for the sake of the gospel? — Biblical Theology, by John Owen (Soli Deo Gloria, 1996), pp. 699-700. 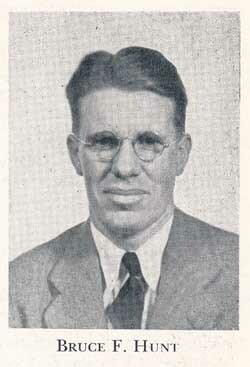 Born Reginald Heber McIlwaine on July 7, 1906 of Southern Presbyterian missionary parents in Kobe, Japan. Heber, as he was known to family and friends, was a natural for missionary service. Coming to a knowledge of Christ as Lord and Savior in his younger years, he learned about Japan and the language of Japan early. In fact, so accustomed was he to this foreign land that one said of him that he may have been an American on the outside, but he was a Japanese on the inside. Graduating from Westminster Theological Seminary in the early years of that historic theological school, he first became an assistant to the Rev. Clarence Macartney at First Presbyterian Church in Pittsburgh. But the missionary call was too strong in his nature to remain there more than two years. 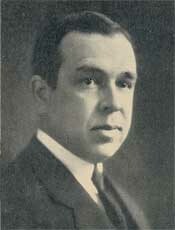 He was appointed by the Independent Board for Presbyterian Foreign Missions to serve in Japan, and did so from 1934 – 1936. Joining the new Presbyterian Church of America in 1936, and was sent next to Harbin, Manchoukuo. Choosing to remain with the PCofA in 1937, he became one of the first foreign missionaries appointed by their Committee on Foreign Missions. In 1938, he was sent to Japan, but the rising war clouds forced him to return back to the States, where he served as a pastor and Army chaplain. From 1947 to 1950, he ministered to Japanese aborigines in a mountainous area of Taiwan. Finally, in 1951, he returned “home” to serve full-time as a missionary in Japan, and did so until his retirement in 1976. After friends had thought he would remain a bachelor the rest of his life, R. Heber McIlwaine surprised everyone and married Eugenia Cochran on March 4, 1947. It was said of her that she was almost as “Japanese” as he was. At any rate, they would serve together for twenty-five years in Japan. Most of their service was at their home in Fukushima, north of Tokyo, Japan. For those who judge success by numbers, their ministry was not successful. The average number of worshipers was under twenty. But many of those converts from paganism to Christianity moved elsewhere for employment or service, taking their Christian commitment with them. The Reformed Church of Japan was, in the words of John Galbraith, “greatly enriched by” their ministry. Both were to be translated to heaven in the latter years of the twentieth century. Certainly it can be said that their works continue to follow them in the faith and life of Japanese Christianity. The R. Heber McIlwaine Manuscript Collection is preserved at the PCA Historical Center. Words to Live By: Faithfulness to the gospel is the only rule of success in the kingdom of God. It is the world which measures success by numbers, by growth, and by economics. When that formula is brought into the church, not only does God withhold His blessings, but many faithful men and women are marginalized from the service of the Lord Jesus. Let kingdom work be measured by kingdom standards, that is, those of the Bible. Attention is called to the words “cunningly devised fables.” The King James and the American Standard Versions translate the word “fables.” The Revised Standard Version translates it “myth”, which is no doubt closer to the original. Fables have to do with stories of animals which speak and talk like men, such as in Aesop’s Fables. But according to Webster a myth is “a story the origin of which is forgotten, ostensibly historical but usually such as to explain some practice, belief, institution, or natural phenomenon.” “A person or thing existing only in the imagination.” “Myths are especially associated with religious rites and beliefs.” A myth is a story “ostensibly historical” which explains a belief or institution associated with religion. The contrast is brought out clearly in the two verses of our text. Peter and the apostles knew that the religions of their day not only were based on myths but that the great majority of the people knew nothing of any other form of religion. So he says, “Yea, I will give diligence that at every time ye may be able after my departure to call these things to remembrance.” “For we have not followed cunningly devised fables—but were eyewitnesses of his majesty.” The religions of his day were recognized as being cunningly devised but Peter claimed the authority of one who with his own eyes had beheld the glory of Jesus or as we find it in John, “we beheld his glory, glory as of the only begotten of the Father.” It will not be necessary to remind you that Paul bases his authority as an apostle on the fact that he had seen the Lord Jesus. And yet Peter goes on to say in the 19th verse “and we have a more sure word of prophecy.” We need not go into the discussion as to whether Peter meant to speak of the written word of the Old Testament as on a par with or above the testimony of the apostles; it is sufficient that Peter says we have a surer word since they had seen the Christ and his works, they had been given the Holy Spirit and even the Old Testament prophesies bore the sign and seal of the word of God spoken through holy men who so recorded it. The contrast between the myths that formed the basis of the other religions of his day and the “surer word” which was the possession of the Christians of that day. How the church has been cursed with myths in spite of the warning and assurance of these apostles! We can only refer to some of the myths which grew up in the Roman Catholic Church, many of them still cherished. The myths of the childhood of Jesus; how he and his friends made clay pigeons and when he commanded, they actually came to life and flew away. Or the myth of the Immaculate Conception; that is, that the Virgin Mary was born sinless. Or the myth that the Virgin Mary has special access to Jesus in Heaven and our prayers will be answered more readily if made through her. Or the assumption of pontifical authority by the Apostle Peter. All of these things are held as historical and much of the life of that church is built on the assumptions associated with them. As for us here in Japan, we blushed with shame as we read of the ceremonies throughout the land and the world as the arm of Xavier was carried from city to city. We grieved to hear the Japanese Buddhists referring to those performances as being very similar to Buddhist practice. It would seem to insult the reason of man, to say nothing of the power of our Lord, and yet the whole mythical ritual was carried out by a world church. But has Protestantism, or the Protestant Church, a better record? Since the name of Reinhold Niebuhr of Union Seminary, New York, has been in the religious news, Japanese ministers have asked me of his theological views. Being ashamed to say I had not read any of his books, I was compelled to buy his “The Nature and Destiny of Man.” In that book, he speaks not infrequently of “the myth of the fall” (of Adam). In other words here was a so-called leader of Protestantism who believes that some of the theories of Genesis are based on myth. It has not been more than ten years ago that I sat in a church in New York and heard Dr. George Buttrick, also of Union Seminary, preach a sermon based on “that beautiful myth” of the raising to life of the man thrown on Elisha’s bones, found in 2 Kings 13. Now when I was in the Seminary in Richmond some thirty years ago, it was generally understood that Union New York had departed from the faith as to the authenticity of the Bible. This year I find Dr. Buttrick speaking at the Centennial of Austin College, and Dr. Coffin, of the same Seminary, invited to speak in Richmond. In other words, we find our own beloved church making common cause with men who believe that much of our Scripture and hence our religion originated in myth and legend. Now if we are to follow the counsel of the apostles appointed by our Lord we must not “be given to Jewish myths” and Peter denies that the things he preached had anything to do with “cunningly devised myths.” If there are Jewish myths in the Old Testament they should be avoided and yet the leaders of Protestantism for the last half century have been more and more accepting, approving and proclaiming the mythological origin of much of our Bible or, what is worse, they tell us, as long as we follow Jesus, it makes no difference. Sunday: Come back tomorrow for a sermon by the Rev. Lardner W. Moore.